AstroGrav for mac is an astronomy software that allows you to simulate how astronomical objects move and interact under the force of gravity for Mac OS X. It features superb interactive 3D graphics which allow you to move around within a many-body astronomical system, while watching how it evolves with the Passage Of Time. AstroGrav can be used to visualize and understand the following aspects of gravitational systems and astronomical systems. 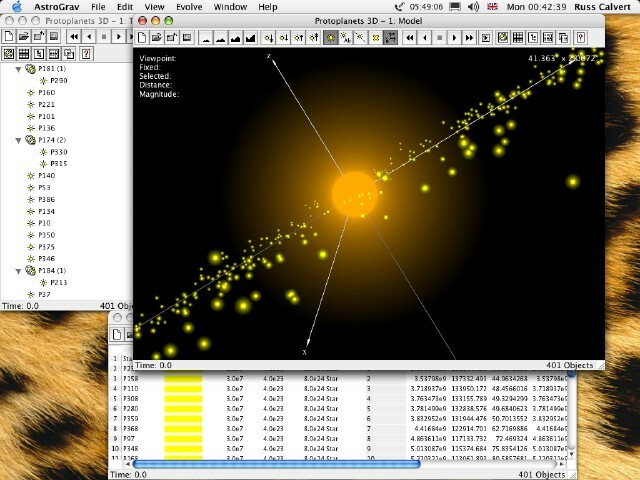 AstroGrav is an astronomy software program for mac. ...... to enter your own data. The comprehensive editing facilities allow you to either create your own astronomical systems, or to modify existing ones, and provide you with an almost endless scope for experimentation and investigation. AstroGrav for mac can be used to visualize and understand the following aspects of gravitational systems and astronomical systems. Version 1.7.1 of AstroGrav for mac is an upgrade containing minor improvements and bug fixes. This information is intended for existing users who are already familiar with AstroGrav and want to quickly find out about the main changes. Qweas is providing links to AstroGrav for mac 1.9.4 as a courtesy, and makes no representations regarding AstroGrav for mac or any other applications or any information related thereto. Any questions, complaints or claims regarding this application AstroGrav for mac 1.9.4 must be directed to the appropriate software vendor. You may click the publisher link of AstroGrav for mac on the top of this page to get more details about the vendor.